When evaluating NFL quarterbacks, there are four qualities that separate the good from the also-rans: accuracy, anticipation, mental toughness to stand firm in the pocket against pressure and the ability to forget about any previous transgressions. Result: Cam Newton 37-yard pass to Ted Ginn Jr.
What happened: Breaking the huddle for this final drive with the NFC South title on the line, the Panthers offense and quarterback Cam Newton had struggled against the active Saints defense. It certainly didn’t help that Newton was battling an ankle injury, and top receiver Steve Smith had left the game earlier with his own injury. And what a play it was. 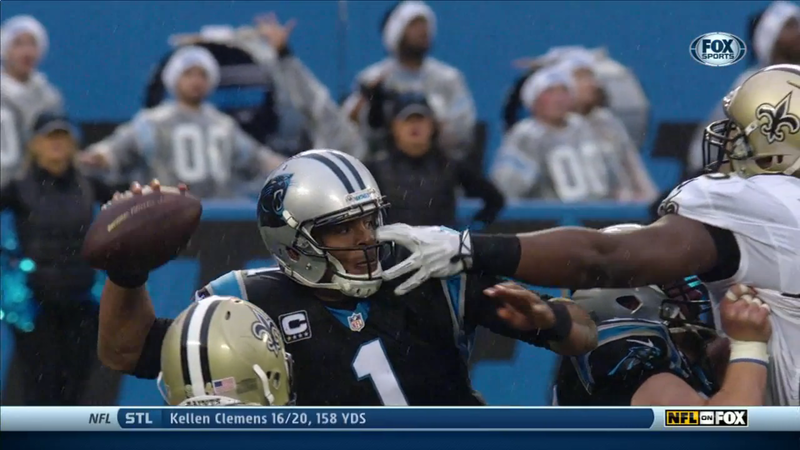 You won’t see many finer by a QB under duress. It was nicely designed by offensive coordinator Mike Shula. He figured the Saints would go with some sort of zone coverage and looked to find a soft spot in the middle of the field. 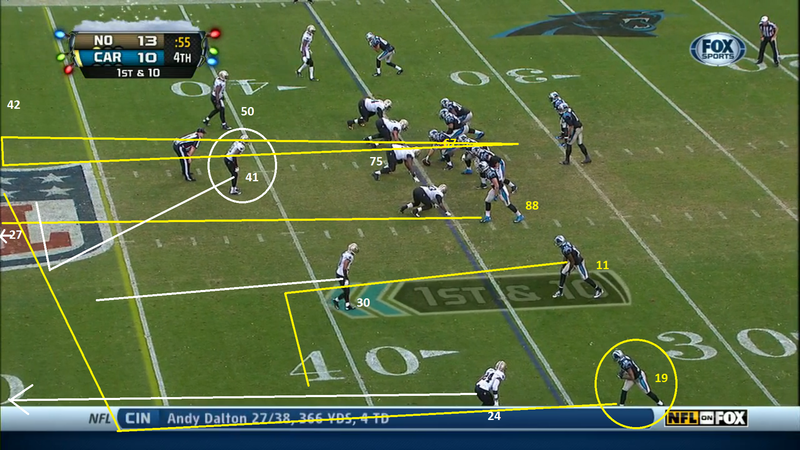 The Saints played a three-deep coverage, four-under zone. Tight end Greg Olsen (88) would run up the left seam as the No. 1 option and at minimum take the middle-of-the-field safety, Malcolm Jenkins (27), out of the play. 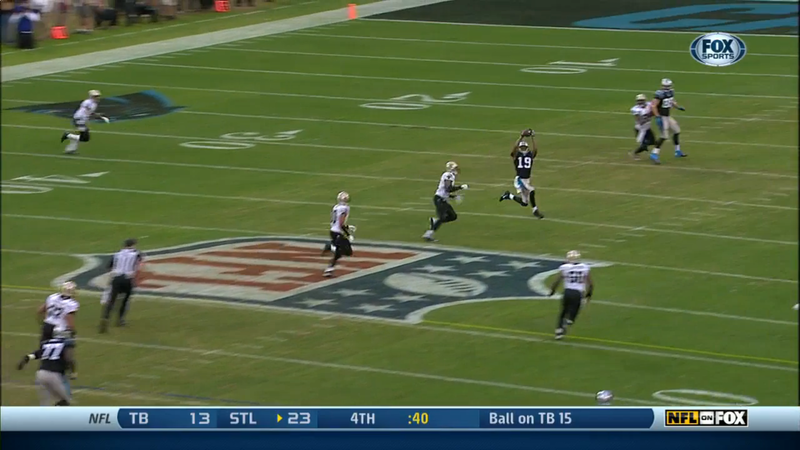 Receiver Ted Ginn Jr. (19) would drag all the way across the field, and Newton would have to find him in three different windows. The final options were dump-offs to Brandon LaFell (11) in the left flat, or running back Mike Tolbert in the right flat. The other crucial part of this play was the offensive line giving Newton enough time against a four-man rush to find the open receiver. 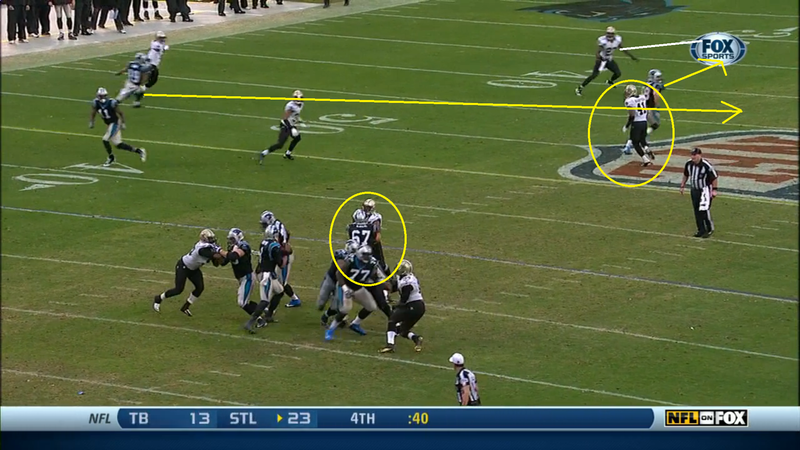 That included a crucial one-on-one block by center Ryan Kalil (67) against defensive tackle Tyrunn Walker (75). The protection started to crumble early, and a lesser quarterback would have scrambled and screwed up the timing of the play. But Newton calmly stepped up in the pocket and was unafraid to move right into the back of Kalil (talk about trusting your teammates). 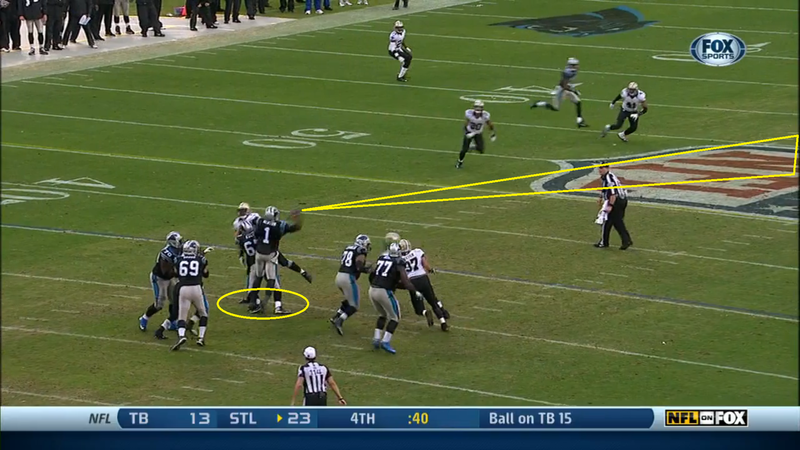 That did not allow Newton to step into his throw at all. With Walker hitting his facemask and then grabbing his jersey, Newton threw flat footed and with all arm, anticipating that Ginn would continue on his route past safety/linebacker Roman Harper (41). Harper could have played it a little better by anticipating Ginn’s crossing route and not getting caught staring into the backfield, but that still might not have stopped the Panthers. 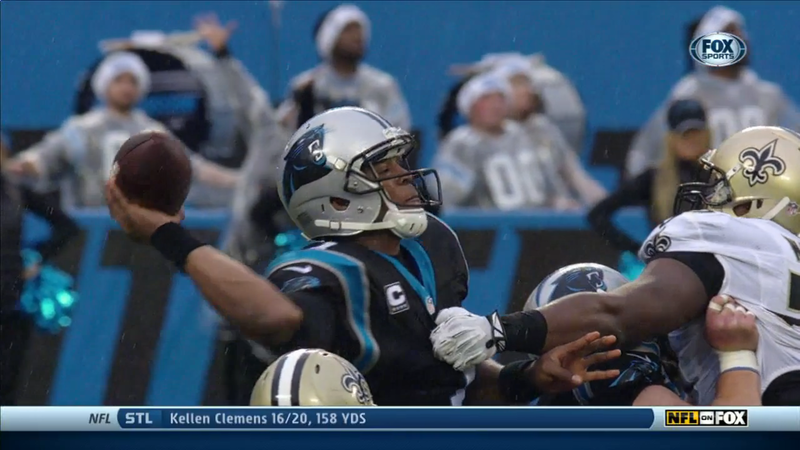 Newton was simply too good on this play, which got the Panthers into field-goal range and gave them the confidence to try for the game-winning score four plays later. What happened: Already in field-goal range, the Cardinals could have gone conservative with a safe run, kicked it and played defense. But with Arizona needing a win to stay in playoff contention, coach Bruce Arians decided to be aggressive despite quarterback Carson Palmer’s four interceptions to that point. “In our second halves all year, the offense has answered the bell, no matter how ugly it’s been to that point,” Arians said. “(Palmer) knows why he did things (earlier in the game). If they’re good, bad or ugly, he forgets about them and goes to the next one. He’s really a corner playing quarterback. 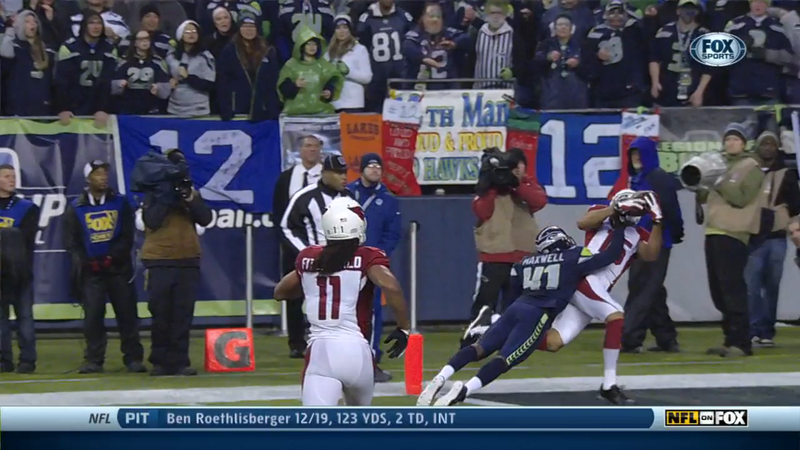 The Cardinals knew the Seahawks would be aggressive to stop the run, trying to make a field goal even longer. 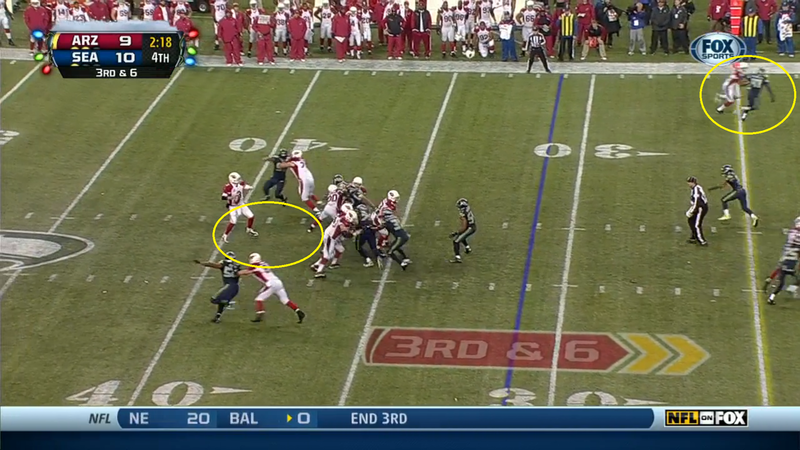 That meant Seattle would come with a blitz and leave their cornerbacks one-on-one. 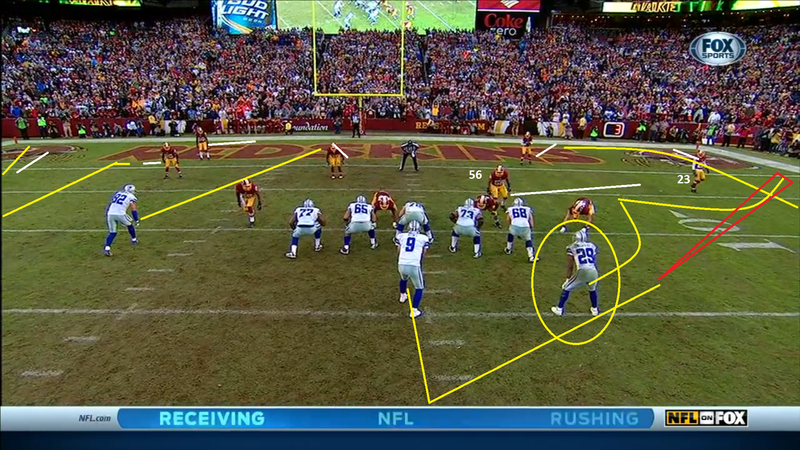 That’s exactly what they did, with a Cover Zero blitz that left no safeties to help in coverage. Arizona decided to test young cornerback Byron Maxwell (41) in coverage on Floyd, who hadn’t caught a pass up until that point. The play was very simple, but difficult to execute. Everything had to work perfectly. 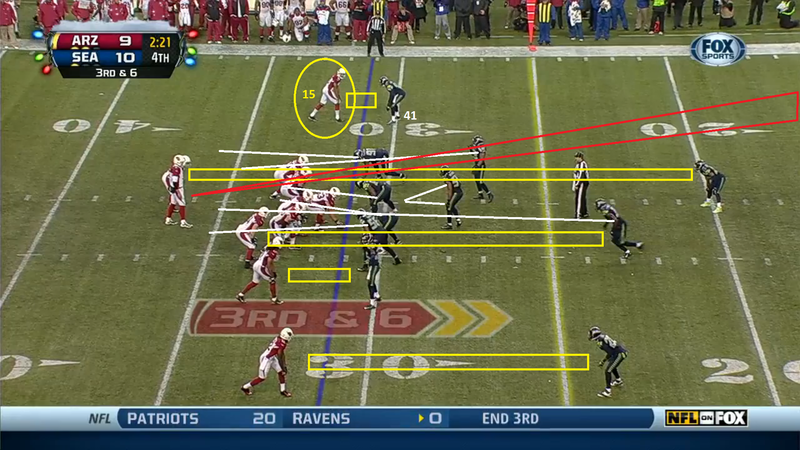 The Cardinals’ leaky protection had to hold up against the Seahawks’ tremendous pass rush. Floyd had to beat Maxwell and catch the pass with little room to work. 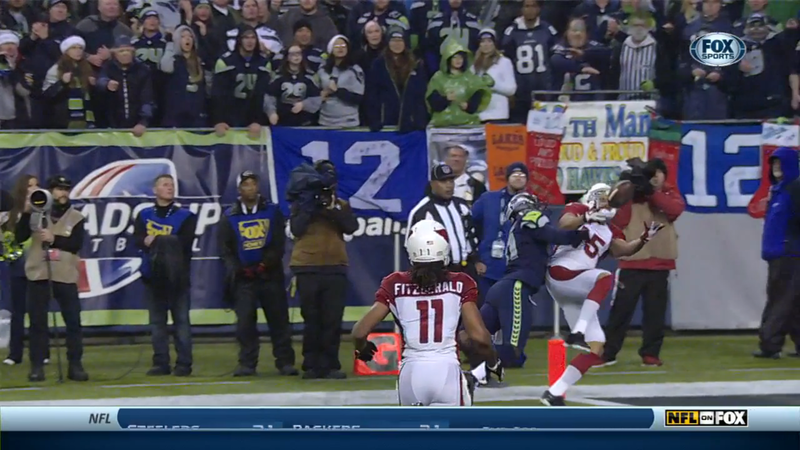 And Palmer needed to make a perfect pass. 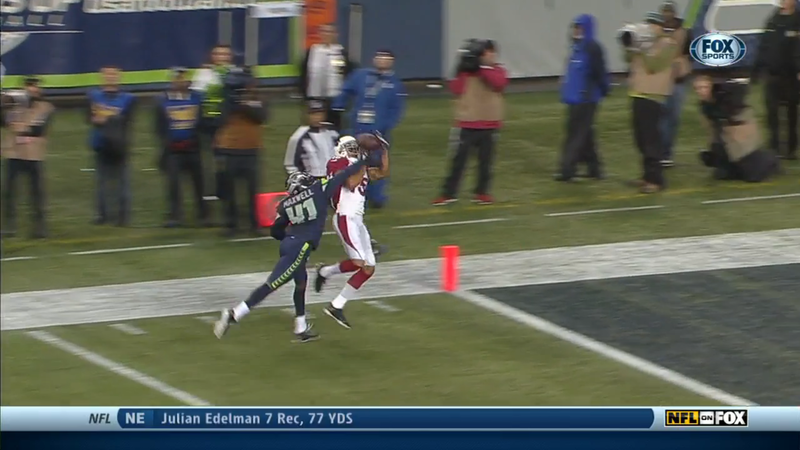 All of it happened, highlighted by Floyd’s juggling catch with Maxwell draped all over him. What happened: Just seven days after throwing two critical interceptions as his team blew a 23-point halftime lead in one of the worst failures in franchise history, quarterback Tony Romo again found himself in a crucial spot with (at the time) the team’s playoff hopes resting on one final play. No time to dwell on the past, or a back injury that had hobbled Romo during the game. 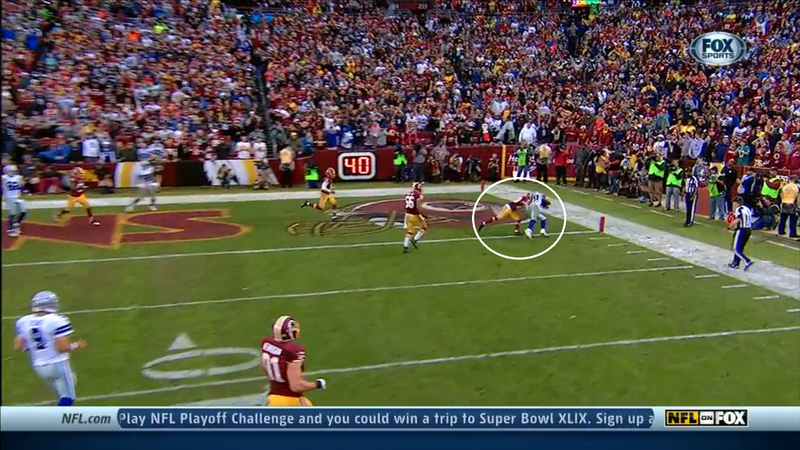 Romo came through on this play, but it wasn’t his heroics alone. Give credit to the Cowboys’ offensive line, which gave Romo all the time and space he needed, running back DeMarco Murray (29) for staying alive on the play, and Washington owner Daniel Snyder for still not getting the FedEx Field turf right. 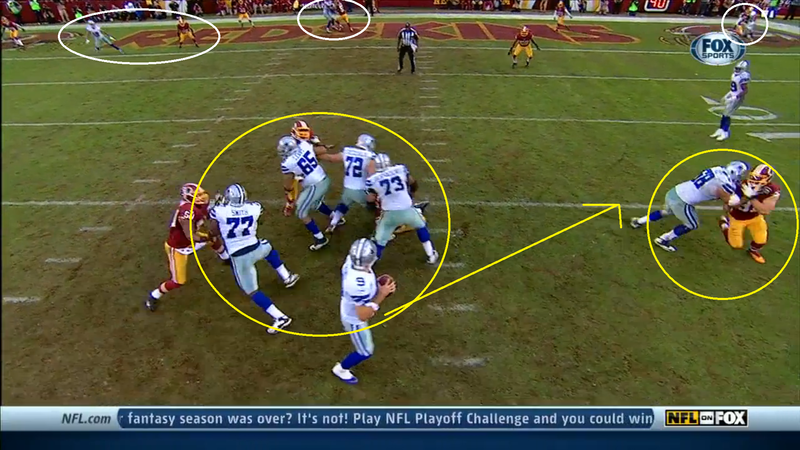 On the play, Washington had every option well covered with a zone in the end zone. That left Romo with only one option: a toss to the right to Murray, who had wandered far enough from linebacker Perry Riley (56) to turn and dive into the end zone just before cornerback DeAngelo Hall (23) could stop him. 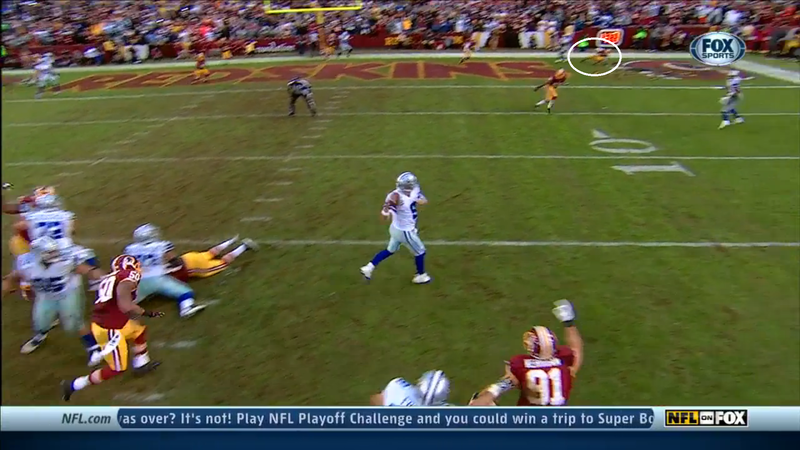 Maybe Hall might have made the play had FedEx Field had artificial turf. The TV replays revealed that Hall initially slipped trying to get upfield to tackle Murray. That split second might have made the difference between a touchdown and a tackle just shy of the goal line to give Washington a victory.